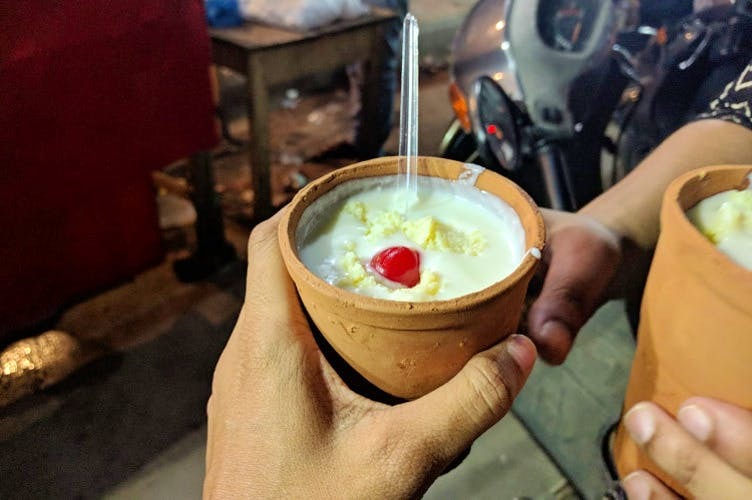 Located in the crowded market street of Ameerpet is Kashmiri Lassi — a roadside stall that is considered as a blessing in disguise for shoppers and fellow passersby. Let’s see how we liked it! As the clock strikes 6pm, a large gathering of foodies throngs to the stall for their share of lassi. Although a popular hang-out spot in Ameerpet, it is quite a hidden gem in the city. Unable to contain our excitement after hearing the raving reviews, we hit the stall one evening, which is more of a table with matkas full of lassi and khoya neatly arranged. Forget a parking lot, you’ll barely find space to stand and relish your lassi, so be sure to share your (private) space with a bunch of merry strangers. Don’t let that turn you away. Gather your squad (just like we did) and go here to gratify all your street food (and sweet tooth) cravings. This 50-year-old kiosk is known only for its Kashmiri Lassi. So, we asked for a round of lassi and were offered two options — matka lassi (INR 50) and lassi served in a plastic glass (INR 30). We opted for the matka lassi. Topped with a generous helping of khoya and red cherries, our lassi arrived in matkas. Quickly, we dunked our spoons into the matka and relished our khoya before we proceeded to sip on our lassi. The lassi was creamy, fresh, and perfect for them Summer evenings. What we really loved is that it wasn’t too sugary and had just the right amount of sweet. Plus, the matka made all the difference as the earthy aroma added to the flavour. This is legit Hyderabad’s best lassi and we’ve been singing its praises ever since we tried. If you live in and around Ameerpet or passing by the kiosk, be sure to grab a glass of it.